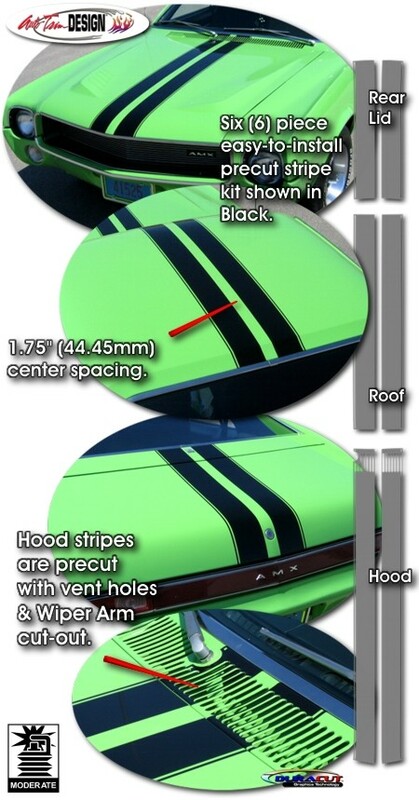 Need a new "Go" package stripe kit for your AMX? Our six (6) piece precut stripe kit closely matches original factory striping and is all set up for easy installation - including precut vent holes and Wiper Arm cut-out! Available in a wide variety of colors, stripes are 4.3125" (109.5375mm) wide, featuring a 0.1875" (4.7625mm) pinstripe as shown. This stripe package is not just a set of strips in a box. Our graphic kit is specifically fit for 1968 or 1969 American Motors AMX Hood, Roof and Rear Lid areas and consists of prefitted and contoured pieces as shown in the illustration. Striping is set for 1.75" (44.45mm) center spacing at time of installation. Easy-to-follow general online application and care instructions included. Please Note: While this kit is precut for area lengths, minimal trimming is required at hood and rear lid openings. Note: Trimmable two (2) piece Spoiler Kit (ATD-AMAMXGRPH2) includes two (2) 4.3125" x 21" (109.5375mm x 533.40mm) pieces that can be hand trimmed for custom spoiler applications.